Improper Surveillance and Protection of Whistleblowers [PDF] (AKA "The Snowden Treaty") was created by David Miranda, Glenn Greenwald's partner, who was detained by UK police under terrorism legislation while transiting through London's Heathrow airport with a encrypted thumbdrive containing some of the Snowden leaks. 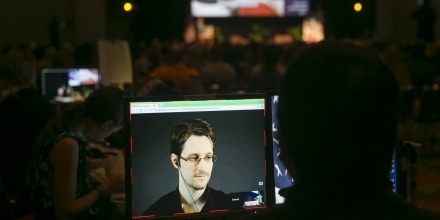 The treaty, which has Snowden's endorsement, is co-sponsored by the international NGO Avaaz, and will be the first instrument of its kind: an agreement among nations to protect people who expose official wrongdoing. The treaty arrives at an important moment: with the first tremors of the age of privacy breaches upon us, officialdom's response is to enable more spying and to immunize companies who rat out whistleblowers from liability for breaching their customers' privacy. Without a counternarrative about security that involves protecting populations rather than putting them under suspicion, we are headed down a very dangerous and scary path.